Carbonated Water, High Fructose Corn Syrup, Natural and Artificial Flavor, Tartaric Acid, Citric Acid, Potassium Benzoate (a Preservative) Gum Acacia, Red 40, Blue 1. Filtered Carbonated H2O, Real Sugar, Natural Grape Flavor, Malic Acid (from apples) and Berry Extract (for color). Look at how much better the mixin’s are?! Definitely NOT perfect but you know what, it’s soda, so this is waaaaay better. 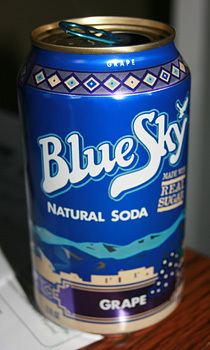 I know I’ve said this before but I am a fan of Blue Sky when I need that liquid bubbly somethin’ sweet. I like them for their decent sodas and for using NO artificial flavors, NO artificial colors, NO preservatives, NO caffeine, sodium free, GMO free, and NO high fructose corn syrup. Nice. Grape soda, how do I love thee?